This is the common case when you have reporters in the field with LUCI Live on their Phone or laptop and they want to transmit live to the studio for direct transmission on-air. The studio will have it’s own static ip-address and may even have webservers running in house. LUCI Live will then have to be configured for use as a live contributor on the Phone or laptop and LUCI Studio as a server in the studio. First thing you have to do is to make sure that the port for UDP (normally 5010) is forwarded to the computer where your copy of LUCI Studio is running on (call it a Live-server). This is the same as what you do when you forward traffic for your webserver on port 80 to your webserver. Read more about port-forwarding here, and our HOW TO: UDP port forwarding for RTP incoming stream. All you have to do is to not fill in the name or address of the server (ie. no destination) like on the left. Just like in the example above where both computers are running on the same network. Notice there is no ip-address or URL filled in. Please don’t forget the colon before the port number. This will cause LUCI Studio to listen to incoming streams and not send any stream if there is no stream coming in. If it receives a valid stream, it will start sending back to the Ip-address and port where the stream is coming from. This technique is commonly known as “Symmetric RTP” . shortcut to LUCI Studio in the startup-folder of your PC, so it starts automatically each time the computer restarts. On LUCI Live in the field. You have to fill in the public ip-address (take it from your router) or URL of the studio. Like on the left. 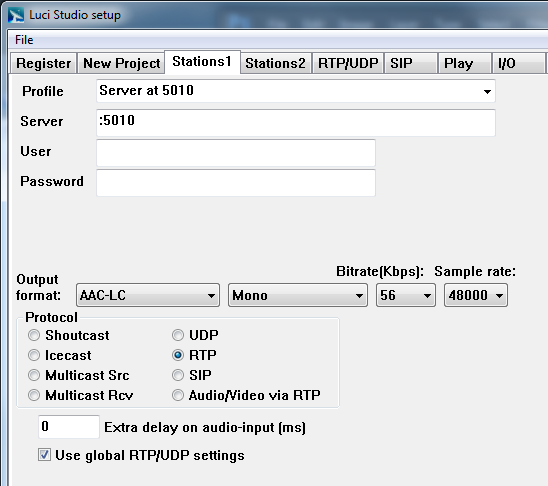 Start LUCI Studio in server view mode, click on the Antenna and MIC. 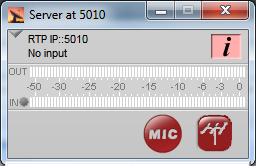 Then start LUCI Live, click the MIC, check levels and then click on the Antenna.